Excellent location close to the centre of the old town. Thought the provision of the simple comforts was limited, such as tea, coffee and water in the room, (without having to pay for it) although this may be cultural. There was a machine in the reception but to get a large mug of tea cost €3 (for the hot water). Very enjoyable and varied breakfast in pleasant surroundings. The staff at reception were very helpful although this was inconsistent. There was also a communication difficulty at times as I speak very little German and although many of the reception staff spoke English when I encountered a German only speaker it presented a problem. Mind you I do accept that being in Germany it’s up to me to learn German or accept the difficulty. The rooms were lovely and cleaned every day to a high standard. 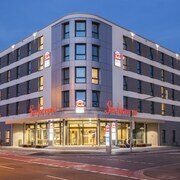 Where to find Heidelberg hotels near an airport? Where can I find hotels in Heidelberg that are near tourist attractions? If you're thinking of traveling through the Rhine - Neckar area and you're after a hotel in Heidelberg, Expedia offers a wide range to select from. Expedia's extensive database lists 54 places to base yourself within a 0.1-kilometre (0.06-mile) radius of Heidelberg's downtown. 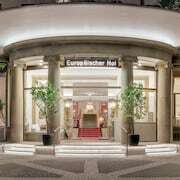 The more central hotels of downtown Heidelberg are the Hotel Europäischer Hof Heidelberg and Crowne Plaza Heidelberg City Centre. One of Heidelberg's most famous tourist attractions is the Heidelberg Castle. The Boutiquehotel Heidelberg Suites - Small Luxury Hotels and Die Hirschgasse Heidelberg are all nearby. Here at Expedia, we appreciate that travelers have differing budgets and needs. So if you're seeking somewhere to base yourself at the more affordable end of the scale, the Heidelberg area offers some nice options. 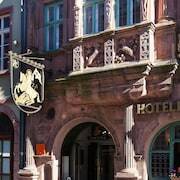 The Hotel Deutscher Kaiser is 2 kilometres (1 mile) from the heart of Heidelberg, while the Kulturbrauerei Heidelberg AG is 2 kilometres (1 mile) away. 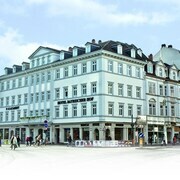 Other budget hotels are the NH Heidelberg and the Leonardo Hotel Heidelberg City Center. The Lindner Hotel & Spa Binshof is 18 kilometres (11 miles) from the heart of Heidelberg. Alternatively, the Hotel Villa Marstall is situated 1 kilometre (1 mile) away. Two more Expedia-listed accommodations include the Heidelberg Marriott Hotel and the Hotel Zur Alten Brücke. Heilbronn is 50 kilometres (30 miles) to the southeast of Heidelberg and is where you'll find Heilbronn Deutschhof and Experimenta Heilbronn. 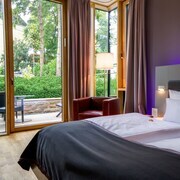 If you'd like to spend a few nights in Heilbronn, check Expedia's booking pages for the latest deals at the Best Western Hotel Am Kastell and Vienna House Easy Neckarsulm. Or, you could consider staying in Mannheim, 18 kilometres (11 miles) to the northwest of Heidelberg, where you'll find the Best Western Plus Hotel LanzCarré and Maritim Hotel Mannheim. The Nationaltheater Mannheim and Mannheim Palace are a couple of the more popular sites to explore for those visiting Mannheim. Before you leave Rhine - Neckar, ensure you catch local game. Visit Commerzbank-Arena to the north of Heidelberg. 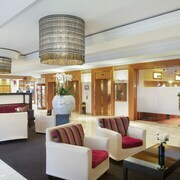 Book accommodation close to the action at the Rocco Forte Villa Kennedy or the Maritim Hotel Frankfurt. Griesheim Airport is situated 50 kilometres (31 miles) from Heidelberg. Should you wish to stay nearby, you can book a night at the Maritim Rhein-Main Hotel or the Maritim Konferenzhotel Darmstadt. 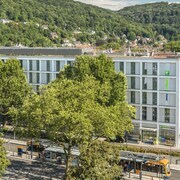 What are the most popular Heidelberg hotels? 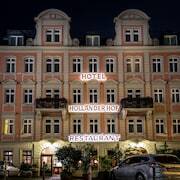 Are there hotels in other cities near Heidelberg? What other types of accommodations are available in Heidelberg? Explore Heidelberg with Expedia.ca’s Travel Guides to find the best flights, cars, holiday packages and more!